I have been putting off posting this blog, because I honestly didn’t know where to begin! Most daunting was to pick from the hundreds of photos we took and shared (gotta love digital pics!). The wedding officially started on Friday night with a pre-party at Liina’s father’s house. This was a great informal opportunity for the 100 or so guests to get to know each other. About half of the guests were from Norway, but despite the fact that nearly all of the Norwegians spoke English, we all received a trifold of key word/phrase translations in Estonian/Norwegian and English. Saturday, however was the big day. My family gathered at our home to get ready. 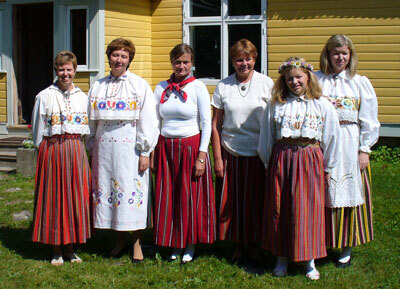 All wedding guests (Estonian and Norwegian) were encouraged to wear their national dress. So here I am (on the left end) with my cousins. My boys (on the ends) were asked to help the flower girls hold all of the flowers that the bride was given after the ceremony. This is traditional. 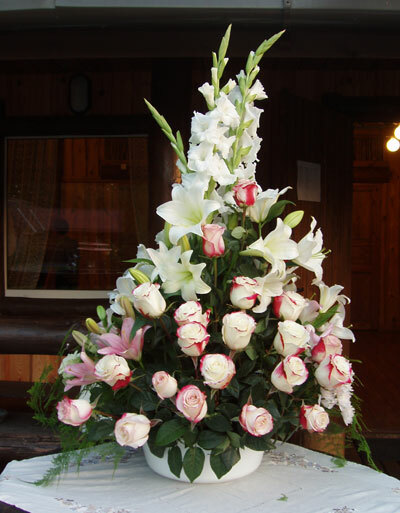 What was really clever, was that Liina had hired a local florist to arrange all of the flowers into beautiful arrangements for the reception. 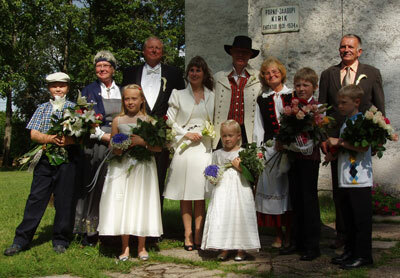 After the wedding ceremony, the bride and groom led a parade of cars through the countryside with a stop at Liina’s mother’s house. Although they were already married, the bride and groom were required to accomplish a series of tasks to prove that they were ready for marriage. Harald had to prove he could chop wood, Liina had to darn a sock and finally, wearing an apron made for 2, they had to peel a potato together. All of the tasks had to meet the approval of the grandmothers seated behind them. It was great fun! Finally, we arrived at the “tourist farm” where the reception was held. Difficult to explain, check out the website to see pictures. www.uueda.ee It is like a resort with many different sized buildings for lodging as well as a central building with a reception hall. 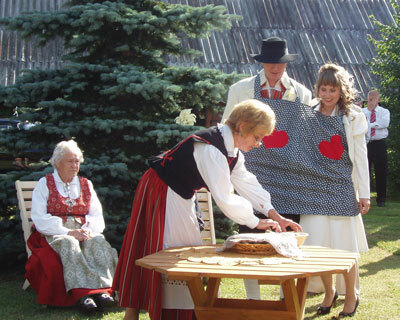 The reception was loads of fun, including all of the usual events – just with an Estonian twist. The main difference was that when we left sometime after 3:00 am – the party was still going strong! 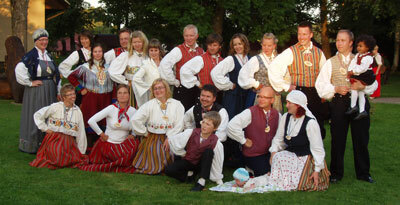 One last picture of all of the guests, Estonian and Norwegian, who wore national dress. I could bore you with lots more pictures, but I’ll stop here. The next post will be all about the quilt! This entry was posted in Estonia 2010, Uncategorized. Bookmark the permalink. That is truly wonderful!! It’s beautiful–so much more appealing than the standard fare you get at typical US weddings. Thanks for sharing!